Arctix ski and snow bottoms are made with quality first and foremost. Before you head outside in cold weather, you can rest assured that Arctix snow pants will keep you warm. Specialized insulation and lining will keep you warm and happy in cold, wet weather. Great for playing in the snow, sledding, skiing, and snowboarding. Arctix is the no.1 Supplier of black bottoms to the snow sports industry, offering high-quality, value-priced snow pants, ski pants and bib overalls. Arctix bottoms are perfect for active sport lifestyles, including snowboarding, skiing, playing outdoors, working in the snow, shoveling or blowing snow, ice fishing, hunting, and attending outdoor sporting events. Unlike most competitors, Arctix pants and bibs are made of nylon fabrics with thermalock coating and Thermatech insulation. Arctix relaxed fit snow and ski pants are designed for maximum comfort and motion. This relaxed fit jacket is also machine washable, making it perfect for outdoor activities. 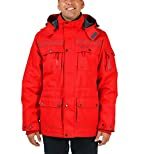 Interested in the Arctix Men's Performance Tundra Jacket with Added Visibility, Large, F Red? Is the price too high? You can easily price watch this product and we'll notify you when the price reaches your target.